A stuck foot post is where you plant your foot firmly in a roughly random place and see what you can see without moving. Best is when you plant both feet but sometimes, as in this post, where you are on a slope or some other kind of difficult ground you may need to move the other around for the sake of balance. But you mustn't move the 'stuck' foot. You can bend your body this way and that. You can lean forward and twist at the waist - but you mustn't swivel that stuck-foot. marked by a Sycamore tree, or maybe a Maple. Either way, it produces pretty key-seeds. 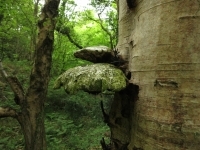 The base of its trunk is below the level of the path so its seeds and leaves are close over-head. I used to go there often but the cliff below is sliding towards the sea so it's no longer safe to walk there. It's tantalising. That's where I stood. 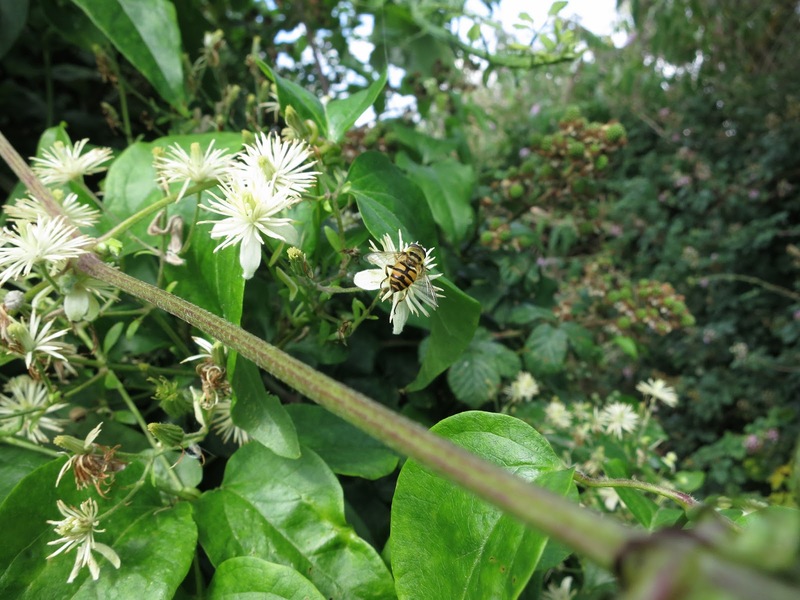 And while I stood there, a hoverfly arrived and flew between brambles (blackberry bushes) and wild clematis. Wild clematis (Clematis vitalba) flowers are small and pretty and round and spiky. Pale yellow. Or maybe rich cream. Borderline colours are hard to describe. They are called 'Traveller's Joy'. Remember them. We'll re-visit in autumn and see their seeds. The hoverfly went. Then it came back. Well, I can't guarantee it was exactly the same one. I'm not sure what it's doing in the picture - but it's fun to see insects getting on with their everyday lives instead of posing scenically on the flowers. 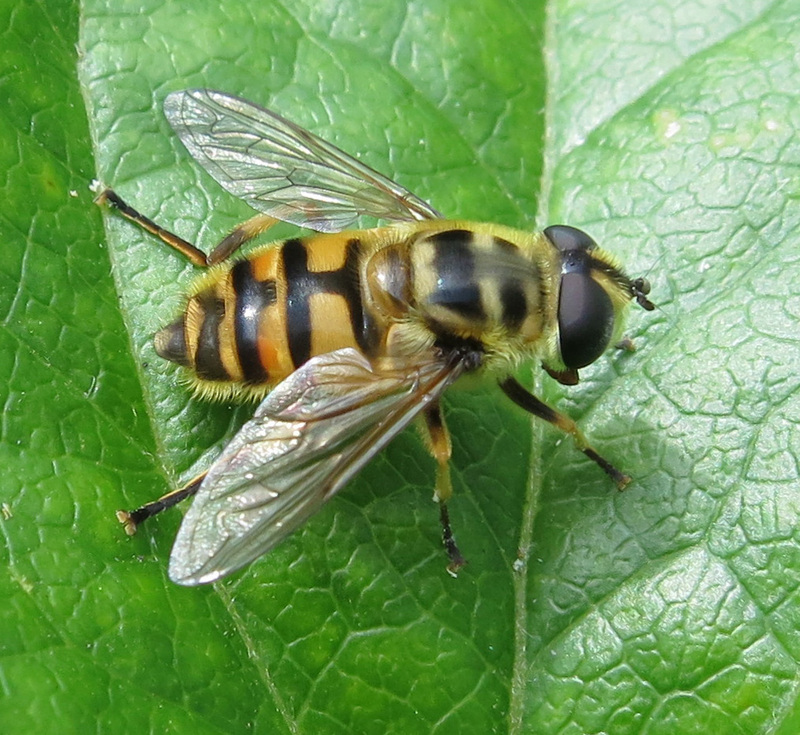 When I put a photo of it on iSpot, Wildlife Ranger commented that we can tell it's a Myathropa florea because it has a Batman sign behind its head and a hairy fringe along its abdomen. See them? 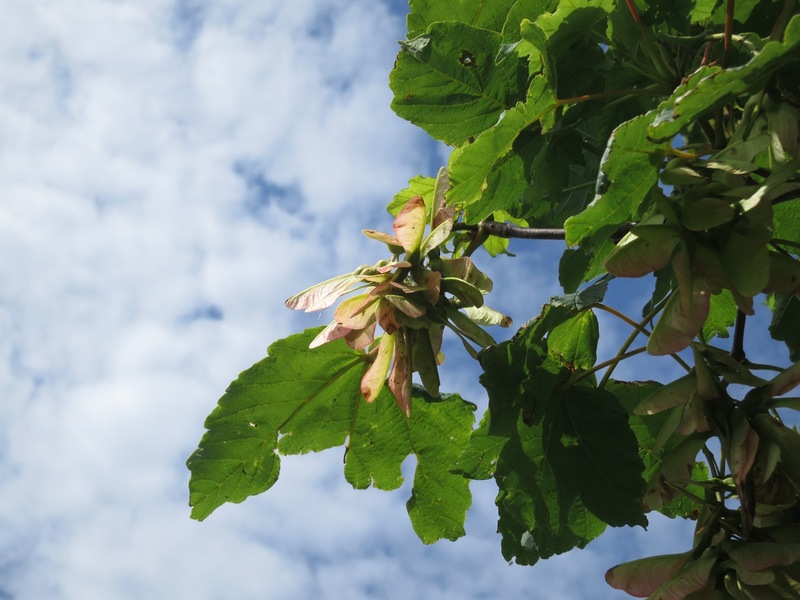 And while I stood there, taking pictures of the hoverfly, a tiny green spider came down on a thread from the sycamore, landed on my camera, hung on, then dangled below it. Gently, I lifted it by its web and put it on a bramble bush. I don't know whether it wanted to be on a bramble bush but if it didn't I expect it would have liked me to take it home even less. I would call this a Cucumber Spider - but that's because I'm not very specific. You'd only be able to tell the difference between it and similar spiders at a micro-level. Going for the Latin - it's some kind of Araniella. 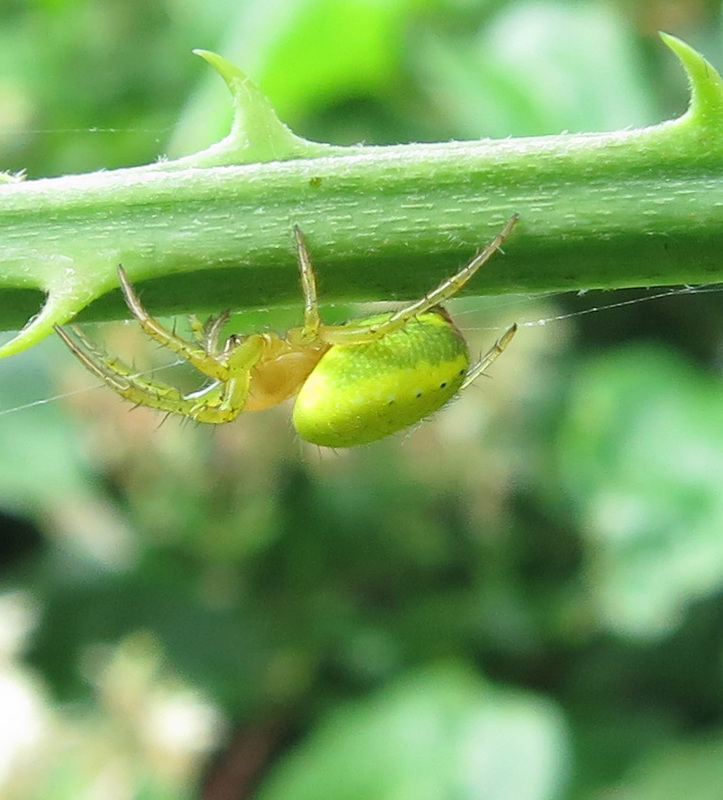 BUT if I see another, I'm going to call it a Cucumber Spider regardless. It's only about 4mm long and it's bright green. 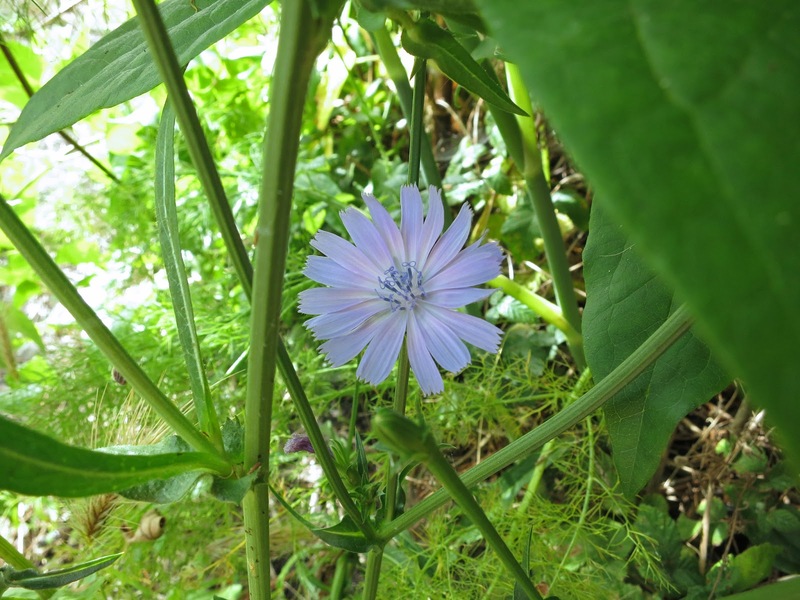 Twisting down to my left, right under the bushes, was a little chicory flower (Cichorium intybus). Chicory grows tall. On other plants the flowers are my-head-high. It was a surprise to find it at ankle level. 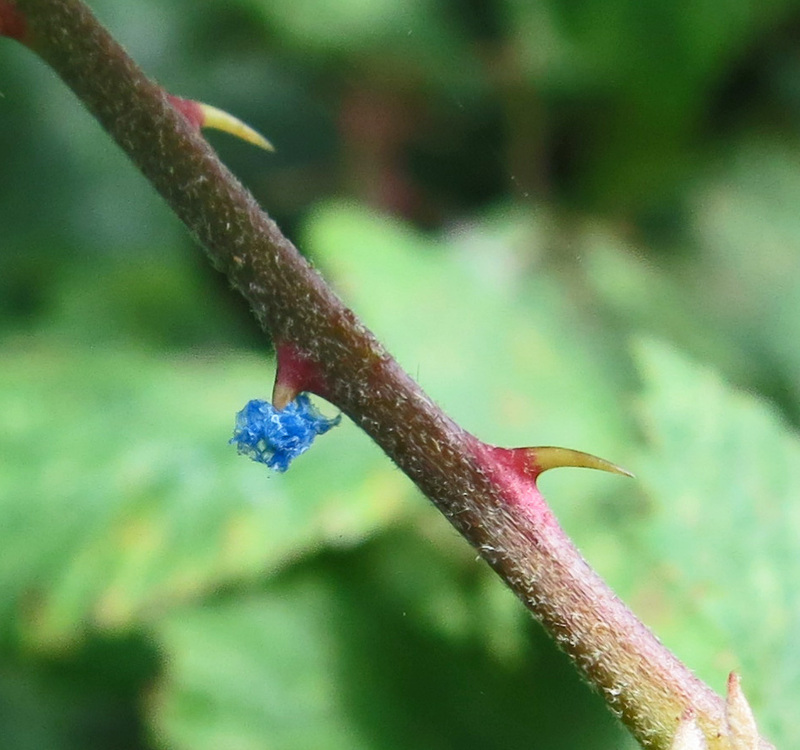 Swinging up and round to the right - there was this blue bit of something caught on a thorn. I don't know what it is. I didn't touch it. I left it there. It was 2 - 3 millimeters across. I doubt it has anything to do with plants. But it was there. That's the point. It was there. Have you written a 'Stuck Foot Post'? I'd be happy to put a link on Loose and Leafy. All photos were taken on 26th July 2014. Thanks for that lovely comment. I love this Lucy, what a brilliant reminder that it is worth just standing still and observing every now and again. We miss so much by walking briskly onwards to something or other. I love the cucumber spider. And the batman sign. Yet another good idea for a post, love your thinking and observation . Have done a Urban post, not sure how to link it to you. Hello Janet. Isn't it great about the Batman sign? 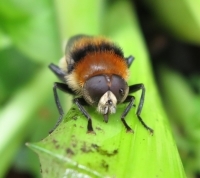 In my vocabulary it will now be called 'The Batman Hoverfly' (Hairy Sides for short.) 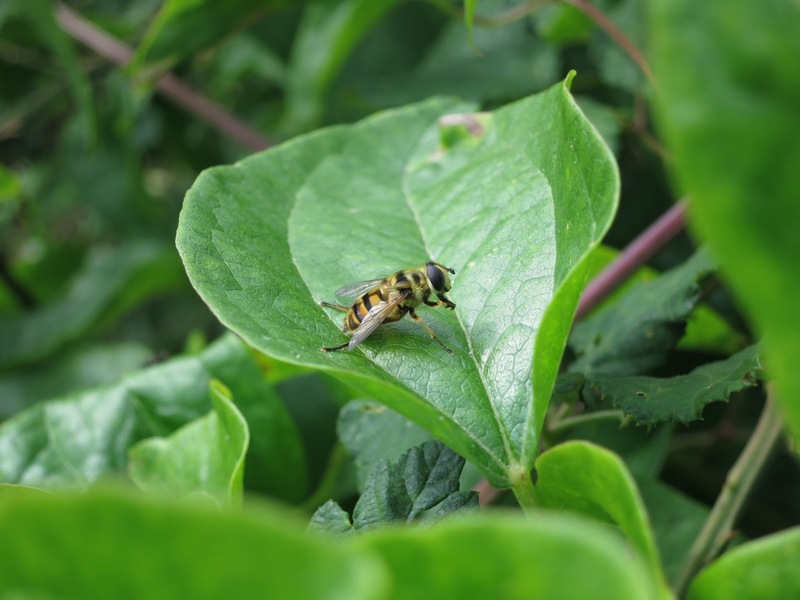 Remembering Myathropa florea is a bit of a challenge. Hello Amanda. If you give me the link to your urban post (you have so many blogs I'm finding it difficult to track it down!) I'll add it to the end of the Southampton Street plant post. I'm thinking if enough people are interested in doing an occasional post about street plants or an occasional stuck-foot post, I may put a box for them a couple of times a year. Amanda - have found your post and have added the link. Great idea Lucy...love the Batman sign behind the head of the insect...so much to see if we just stay put and look...I think I may have to do this soon. A most enjoyable post and wonderful pictures. Hi Donna and Mike. I'm pleased you like this kind of post. The idea of looking for wild plants in urban settings is another kind of post which is appealing to people. I think I will make a link box for Stuck-Foots on 21st August and for Street Plants on 21st September. I'll give it a little more thought then post about the idea. I enjoy your stuck foot posts - surprising what you can see that you probably wouldn't notice otherwise - great photos too. No I've never done a stuck foot post. What a great idea and it really makes you stop and look closely at your surroundings. I love the cucumber spider! Thats a nice idea for a post! I think I may have to do something similar.